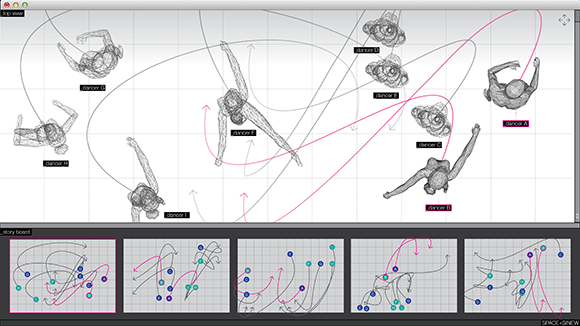 SPACE+SINEW is an application to cater for digitally supported authoring of choreography. The advent of digital music, an art form that previously involved only live performers and acoustical instruments, transformed into a ubiquitous craft that became accessible by many, from professional recording studios to the lone bedroom DJ. Analogously, the digitalization of dance will also open up a new world of possibility without overriding the inherent beauty, expression and theatricality of dance. It will only augment it. I have sought to stake my vision in the future of dance by generating a digital tool for choreographers to figuratively step outside their bodies and create in unchartered environments. The choreographer is able to synch cues and motifs across multiple media, including the music track, dance combinations and staging directions. 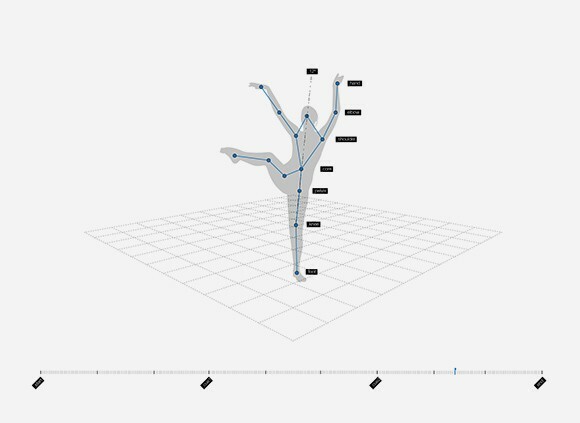 By selecting the icons on the left, which were modeled after Labanotation, one will be able to trace the movement and velocity of specific nodes across all performers. From a bird’s eye view, a perspective rarely seen from the audience, the choreographer is able to facilitate complex dance formations in a poetic storyboard-like environment. The concepts of character rigging and digital puppetry, akin to animation, are incorporated here. Similar to the way one can layer instrumental tracks in music, one can also edit and layer various parts of the human body. One can, for example, record the motion of the legs in one take and then record the motion of the upper body in a later take. 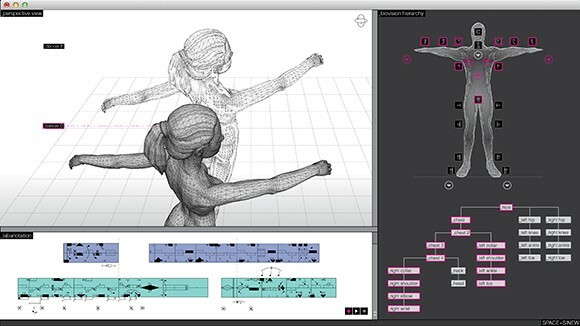 One is also able to edit the intricacies of Labanotation in greater depth alongside the motion capture.